A fumble in American and Canadian football occurs when a player who has possession and control of the ball loses it before being downed or scoring. By rule, it is any act other than passing, kicking, punting, or successful handing that results in loss of player possession. A fumble may be forced by a defensive player who either grabs or punches the ball or butts the ball with his helmet . 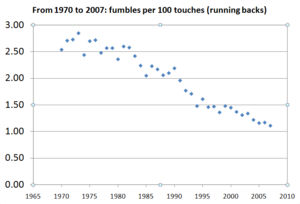 A fumbled ball may be recovered and advanced by either team . 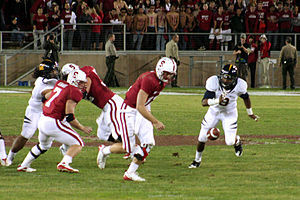 It is one of three events that can cause a turnover , where possession of the ball can change during play.